Arnhem is the capital of the province of Gelderland, located in the eastern part of The Netherlands. The city has about 150,000 inhabitants. Arnhem gained its city rights in 1233. The old city centre got mostly destoyed in the Second World War during Operation Market Garden. In September 1944 fierce fightings between the Allied forces (British and Polish forces) and the German occupier took place to secure the bridge across the Lower Rhine river at Arnhem. 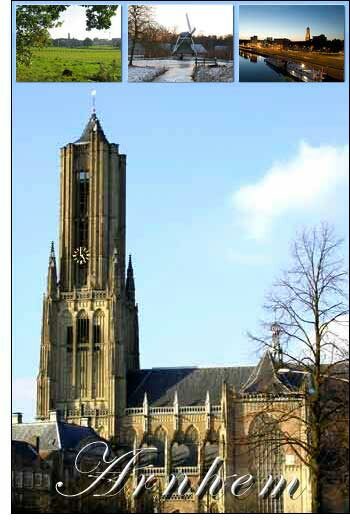 The Groote of St. Eusebius Kerk (Big or St. Eusebius church) is a late-Gothic church built 1452–1560. The church lost most of its tower during World War II, and is partly reconstructed after the Second World War. In the year 1514 Arnhem became part of the Hanseatic League, an alliance of trading guilds that established and maintained a trade monopoly over the Baltic Sea and most parts of northern Europe. In 1579 Arnhem joined the "Unie van Utrecht" (Union of Utrecht), a treaty signed in the city of Utrecht, unifying the northern provinces of the Netherlands to resist against the Spanish occupation. In 1585 the city became a part the Dutch Republic of the 7 United Provinces. The Nederlands Openluchtmuseum (National Heritage Museum) is situated in the woods just outside of Arnhem. The Openluchtmuseum is an open air museum with real, old Dutch houses, farms, mills and factories from diffent parts of Holland. The buildings are from various places in the Netherlands and date from different historical time periods. The park was founded in 1912 and is nearly 44 hectares in area.